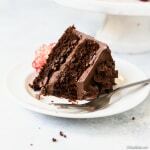 Stop what you're doing and bookmark this recipe, because it is the only paleo chocolate cake recipe you'll ever need! It's easy to make - no mixers or special equipment required - and produces a dense, moist, just-sweet-enough dark chocolate cake with a light spring and a tight crumb. All the taste testers loved it, and many of them didn't even know it wasn't a "regular" cake! Preheat the oven to 350F. Grease two 6" round cake pans, then dust them with cocoa powder. Set aside. In a large mixing bowl, whisk together the almond flour, coconut sugar, cocoa powder, arrowroot flour, baking soda, and salt. Set aside. In a small mixing bowl, whisk the eggs, then whisk in the oil and vanilla. Pour the wet (egg, etc) mixture into the dry (flour/sugar) mixture. Stir to combine. Divide the batter equally between the two prepared baking pans. Bake for 20-25 minutes (it's perfect at about 22 minutes), until set. Remove from the oven and let cool in the pan about 20 minutes before turning out onto a baking rack to cool completely. If, while the cakes are cooling, they start to cave in at the center, cool the pans upside down on a wire rack. Cool completely, or even chill in the fridge, before stacking and frosting. This recipe makes a double layer 6" chocolate cake. To make a single layer cake, make this recipe as written through step 4, then pour the batter into a 9" round pan. To make a double layer 9" cake, double the recipe and divide the batter between two 9" round pans. It will take longer to bake than written; bake until a tester inserted into the center comes out mostly clean. Do not use almond meal or coarse-ground almond flour for this recipe. Use very finely ground blanched almond flour for best results. I used and recommend Honeyville brand. You can substitute tapioca flour for arrowroot flour if you need to, but the texture will be a little more dense and sponge-y. For a sugar free and/or dairy free frosting, use this recipe instead.